[2:30] <Johnjay> Anybody have a clue how to adjust my monitor and refresh rates? [4:50] <irc_smirk> happy pi day everyone!! [6:06] <MrCrackPotBuilde> I think i might be doing something wrong or have a problem. [6:08] <MrCrackPotBuilde> could it be because im using av instead of hdmi ?? [6:25] <Arcaelyx> I put a file named ssh to the microsd card that came with my raspberry pi and plugged in the ethernet cable, but yet it still shows it offline. Any reason as to why that might be the case? [6:26] <Arcaelyx> I see it in my gateway portal along with its local ipv4 address and the name 'recovery' which is to be expected. [6:26] <Arcaelyx> But I'm not sure why it's showing up as offline. [6:28] <Arcaelyx> Nevermind, it's online now but it won't let me ssh into it. [6:29] <Arcaelyx> The OS for it hasn't been set up yet. [6:30] <cyanide> i want to have 3 devices in i2c, one pi, two arduinos. can the two slaves communicate with each other? [13:59] <Dr_Willis> seem to find any router settings about it, and that should block ALL servers from wifi. [14:09] <Dr_Willis> thanks for the help. been trying to isolate this for 2 days on and off. [14:10] <Dr_Willis> now i get to go read up on what PAM is. [14:38] <Dr_Willis> spoke too soon. :) Still doing it, i was testing from wrong machine. but now i know a little bit about PAM. [14:38] <Dr_Willis> thanks for the help. be back later. [14:38] <ShorTie> did you reboot ?? [19:43] <Bilz> joro_, need what? [19:43] <Bilz> what I am trying to do? [19:45] <Bilz> just use the arduino ide? [19:45] <Bilz> i don't feel like learning a new language, so i never bothered with lua. [19:45] <joro_> how do you send the data ? [19:46] <Bilz> joro_, send data between what? [19:46] <stiv> better in what sense? [19:50] <joro_> isn't it hard making this mqtt server ? [20:12] <dff> any truth in that? [20:15] <red9> Speaking of that. Does BT class-1 really have 100 meter (300ft) range? as in IRL test not just spec sheets. [20:17] <CoJaBo> red9: I've been led to believe those ranges apply only to "line of sight in an anechoic chamber"
[20:23] <red9> does bluetooth serial works with iPhones or is that screwed up? [20:48] <dff> anyone have a usb bluetooth adapter to recommend that works ootb? [20:51] <Vooop> the N150 nano - specifically says "ideal for rpi"
[21:45] <GrandPa-G> stiv:Just out of curiosity, how far apart in time do the two sets of data arrive? [21:55] <GrandPa-G> stiv:was it Bilz? Just wondered why didn't do insert when first data came in and update when second part came. [22:08] <GrandPa-G> does anyone have experience with upwork.com re:working on raspberry projects listed? [22:10] <GrandPa-G> Vooop:Complaints? process reasonable? [23:57] <GrandPa-G> I am thinking of writing a program that reads several gpio pins normally from a sensor. However, I don't have the sensor yet. 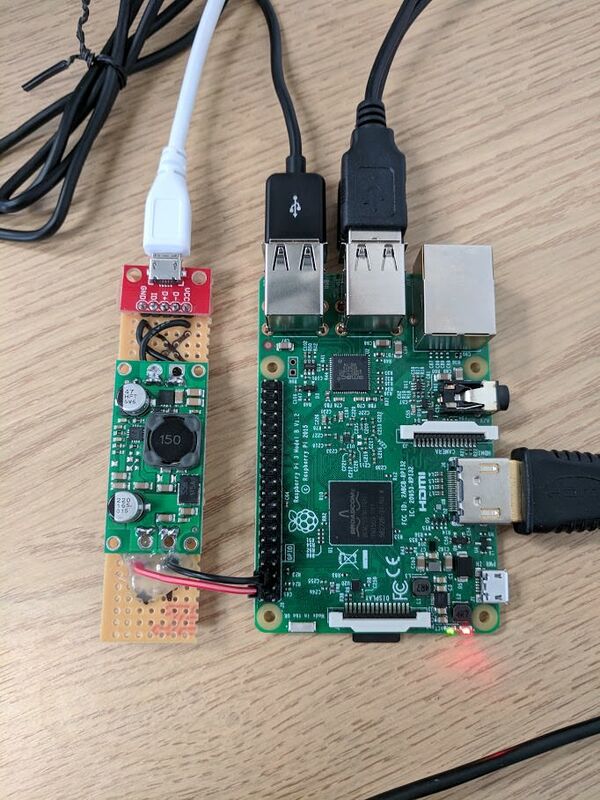 Has anyone made a program that can trigger other gpio pins and have those wired to the sensor pins? Would that work? [23:58] <gordonDrogon> like read a pin then write another pin?